I normally don’t structure my student’s revision much, however this year some of my students asked if I could provide them with guidance on what topics to revise in a given week. Because of this I have written a revision plan, an excerpt of which is shown below. If this will be useful for your students too download it here. I have also done one for Further Maths. 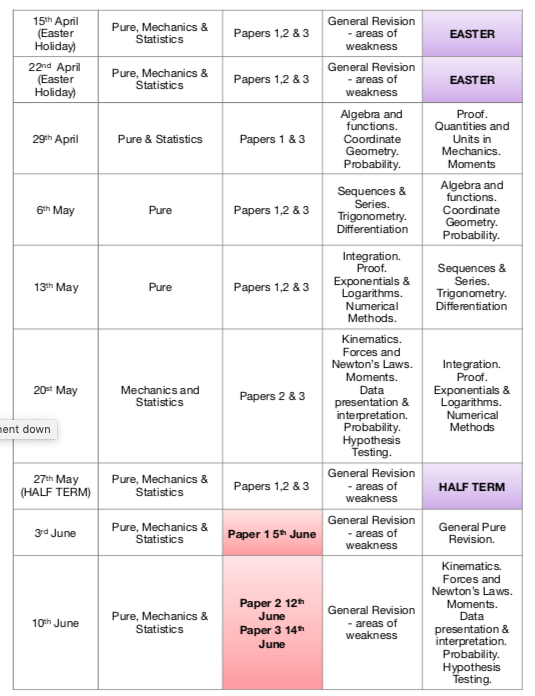 As this is more bespoke and tied to our options (Statistics and Mechanics) for AQA I haven’t uploaded it – if anyone would like it as well please get in touch.